Villa Tamara is self catering villa which is perfect for your holiday. This is traditional stone house placed first row to the sea. This seafront villa has a huge, mature garden full of oleanders and pine trees with swimming pool and sun bathing platform. The villa is furnished in classic style in combination with comfortable modern pieces. The terrace overlooks the sea and it is comfortable for 10 people. You can forget about the car because everything is just minutes away from the property. The villa is on the famous marble side walk that leads to the Golden horn beach. The whole side walk is immerseing in pine trees and it goes beside the shore. You can just walk and enjoy the smell of the sea and the pine trees together with beautiful sea view. All the way to the main beach you will find a lot of fabulous, smaller beaches. On that way you will also find facilities for diving, water skiing, kayaking, jet skiing and wind surfing. Booking details: Payment is 30 % of the total amount on booking (if booking is 45 days before the holiday). Full payment is due if booking is made less than 45 days before the holiday. The payment of the balance is due 45 days before the holiday. Bol: Bol is just about a hour away by boat from city of Split, which is second biggest Croatian city, well connected with the rest of Europe. Brac also has it's own airport, enabling you to get to Bol really fast and convenient and spend beautiful holidays. With it's unspoiled nature, beautiful beaches (check for Golden cape), cultural and historical attractions, and well developed tourist and sport offers, Bol is one of the best known tourist destinations in Croatia. About Bol: Bol is the oldest coastal settlement on Brac. It exists in the solitude of the southern landscape, at the foot of the Bol crown and Vidova Mountain – the highest island peak and at the same time the highest point of all Adriatic islands (778 m). Bol has many beautiful beaches. To the west from Bol lies the beach Zlatni rat (Golden Horn) one of the largest and most beautiful attractions of the Adriatic. Like a small tongue it extends nearly half a kilometer into the clear blue sea. Our family has owned villa Tamara for almost 30 years. It has changed it's appearance a few times during the years, and in 2010 we rebuilt it from the ground up and added a new level as well. Since it's a family business everyone contributes in there own way Ksenija, being responsible for the bookings, is the first person you'll have contact with and Lada will wait for you and show you the villa. Villa Tamara is situated on one of the best locations on the Adriatic coast. A 10 minute leisurely walk away is the famous beach Golden Horn, and the restaurants and shops are no further from the house. It's close to most summer events organised in Bol, it's also surrounded by greenery and the sea so, depending on the direction of the wind, the sounds are drowned out allowing for a peaceful stay. Villa Tamara is located in the first row of houses, closest to the sea. There's a pool in the garden, surrounded by lavender, rosemary, pittosporums and oleander, that lights up at night. The 5 bikes that are available for use are included in the price. Great place to stay in Bol - probably the most private house and garden on the promenade - so easy to get to beaches, restaurants, shops etc. The promenade and town are busy and bustling, but once in the garden/at the pool/in the house it is quiet and peaceful. The house is very well equipped and the owners were discreet but helpful. Thanks so much. I'm glad you liked our villa. 2 families had a great week on this beautiful island. The villa was well equipped with a perfect location and Lada the host was really helpful. A couple of steps over the path to the sea and a few minutes walk to the "town" with its fresh fruit and vegetable markets, supermarket and delicious restuarants. Zlatni Rat beach was a bit further but a lovely walk along a tree shaded path. Also had a great night at the open air cinema! Thanks. I'm really glad that you like our villa. Great House, Perfect Location, Super Hosts! We stayed here with our family for three weeks and it met all our expectations. The house is a four bedroom, 3.5 bath with lots of room for everyone. Pool and patio is excellent for those really hot days. The house is located directly on the main promenade close to town. The sea is approximatlye 10m across the path from the house!. The house owners live in a separate entrance suit at the back of the house and we are always available and helpful whenever we needed anything. Our holiday at Villa Tamara was perfect from beginning to end. Information was accurate and, if anything, underplayed the location. The Villa was attractive, spacious and immensely practical. The Villa is set back from the promenade to Zlatni Rat, giving easy access to Bol and the beach, yet unlike many neighbouring properties, is well screened and private. We enjoyed the pool but, for us, being able to walk out of the garden, over the path and straight into the sea to swim or snorkel was a real highlight of our stay. We travelled to many parts of Brac and also visited Hvar Town and were so pleased that we chose to stay in Bol with enough restaurants and activities to entertain us but without the high intensity tourism of Hvar. We have already recommended the villa to friends and family and hope to return ourselves in the near future. It is so rare to find a villa and location that surpasses expectations in so many aspects. We had a superb family holiday at this villa in Bol. It was our first time in Croatia so we were unsure when booking about locations etc. The villa is lovely; spacious inside and well maintained with a lovely outdoor eating area, garden and pool.Jovanna was very attentive without being intrusive. The location is great - 2 mins and you are in the sea!! Shops and restaurants a short stroll away.Bicycles meant that you could reach Zlatni Rat beach in 5/10 minutes. Thanks a lot. I'm always glad when my guests are happy. 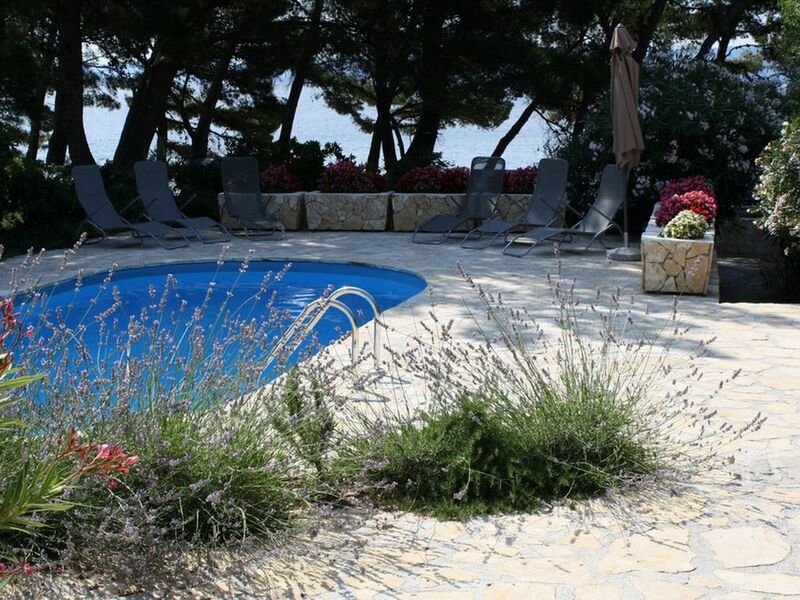 VillaTamara i is a seafront villa placed on one of the most exclusive location on Croatian coast. Property is just 5 m from the beach so beside the swimming pool which is in the garden, guests can enjoy the cristay clear sea practicly in front of the terrace. Brac airport is only 6km away from the house. Cessna flights direct from Split can be arranged. Split airport is 45 km away including a 1 hour ferry trip from Supetar to Split harbor. No distance is great on Brac. The roads are excellent. You can find a lot of things in Bol: bars, restaurants, bakeries, post office, pharmacy, internet cafes, pizza bars, open market, supermarket, open cinema, library, galleries. There are a lot of bars and restaurants overlooking Bol harbor and marina so you can eat your meal or drink your coffee and watch the sea. The sea is crystal clear so you can swim, watch the blue sky and green pine trees. It stretches few kilometers along the coast. The sea in front of it is crystal clear, transparent waves.